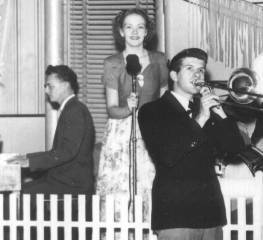 The first show was scheduled for 9pm on a Saturday night in March 1944 from Studio A. By 6:45pm the limited space of Studio A was full and the observation room was overflowing. By 8:30 the standing room only crowd in the lobby and reception area overflowed to 8th street and around the corner down Bluff. The show started late as engineers scrambled to set up speakers outside to accommodate the crowd. Within a few weeks arrangements were made to move the show to the beautiful Melody Mill Ballroom north of Dubuque on Highway 52. 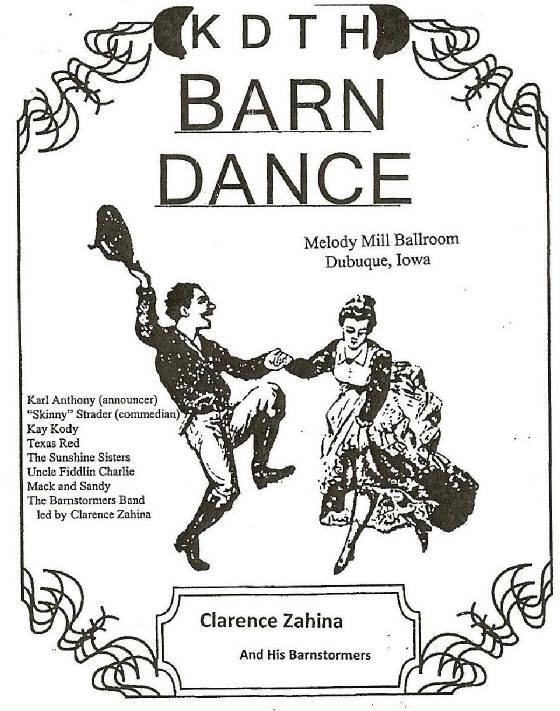 It was Iowa’s largest ballroom and was often filled to capacity with more than 2,000 fans that paid 60 cents each to attend. On the first night a two mile (3 km) long string of cars jammed the highway. 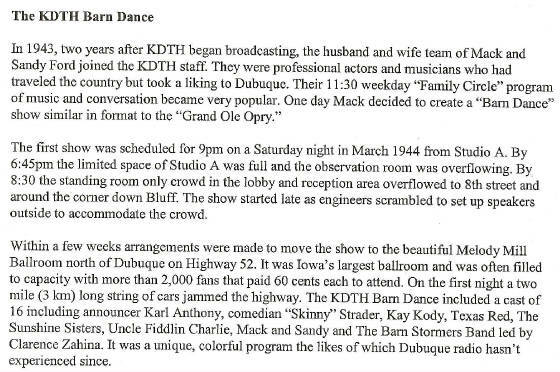 The KDTH Barn Dance included a cast of 16 including announcer Karl Anthony, comedian “Skinny” Strader, Kay Kody, Texas Red, The Sunshine Sisters, Uncle Fiddlin Charlie, Mack and Sandy and The Barn Stormers Band led by Clarence Zahina. It was a unique, colorful program the likes of which Dubuque radio hasn’t experienced since.